The total number of pay TV subscribers in Russia at the end of June stood at 42.46 million as uptake reached around 75%, according to Telecom Daily. The Russian research outfit said that the number of pay TV subscribers in the country was up by roughly 190,000 people quarter-over-quarter, with average revenue per user (ARPU) up 1.2% over the same period to RUB 172 (€2.35). 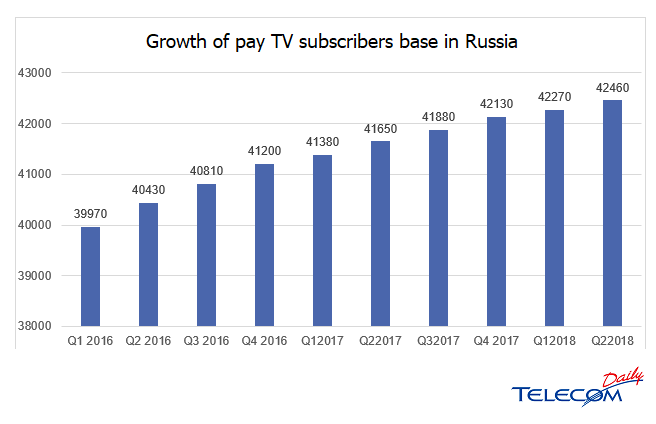 “Growth of the pay TV market in Russia in Q2 was better than in Q1, but it is still lower than in previous years,” said Denis Kuskov, head of TelecomDaily agency. According to the research, nine out of 10 new pay TV contracts were signed by Russia’s top-five largest pay TV operators – Tricolor TV (which had 12.24 customers at the end of Q2), Rostelecom (which had 10.02 million), ER-Telecom (3.69m), Orion (3.13m) and MTS (2.82m).